It’s no secret to people who know me that I am a stress-eater. 60 billion pieces of homework due for tomorrow: Give me all of the shortbread please. Exams: Ima cry-eat this brownie. And as a particularly daunting round of exams is looming, it probably won’t be surprising to find me drinking endless mugs of tea alongside all of that food, either. I find it easier to control my insane sugar cravings during these times by trying to bake things which happen to actually make me feel full. Eating a regular brownie never makes think ‘wow I am so stuffed’. It’s more like ‘that brownie was a pre-brownie trial round. Now for the real thing, gimme another good sir!’. 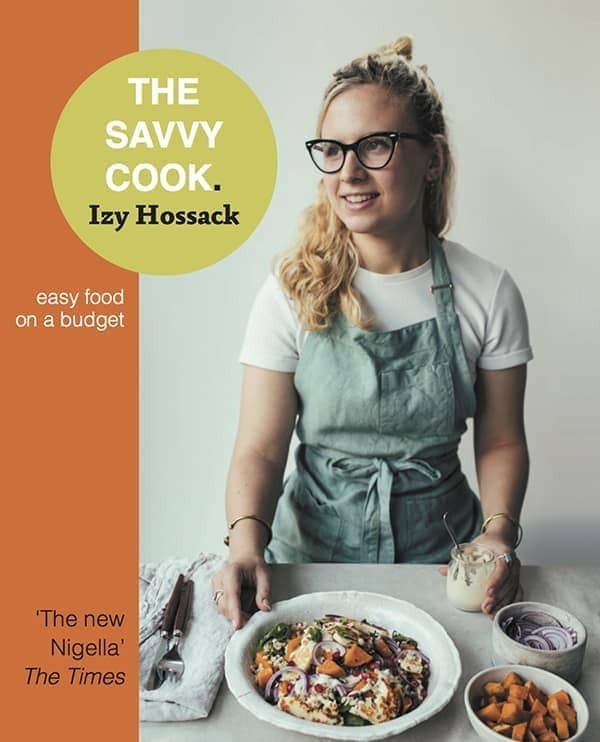 And that’s why I often use things like flax seeds and oat flour when baking – the fiber and protein (and healthy fats in the flax seeds) are what keep me satiated so I don’t end up gorging. So if it’s such a cool ingredient, then why is this one of the first times I’ve mentioned it on here? Well, the frustrating thing is that coconut flour is a pain in the arse to develop recipes with. It absorbs crazy amounts of liquid and has no real binding quality so usually requires a LOT of eggs to go with it. I’m not a fan of overly eggy textured desserts (i.e. souffles or custard-like things) so I haven’t used it much in the past. 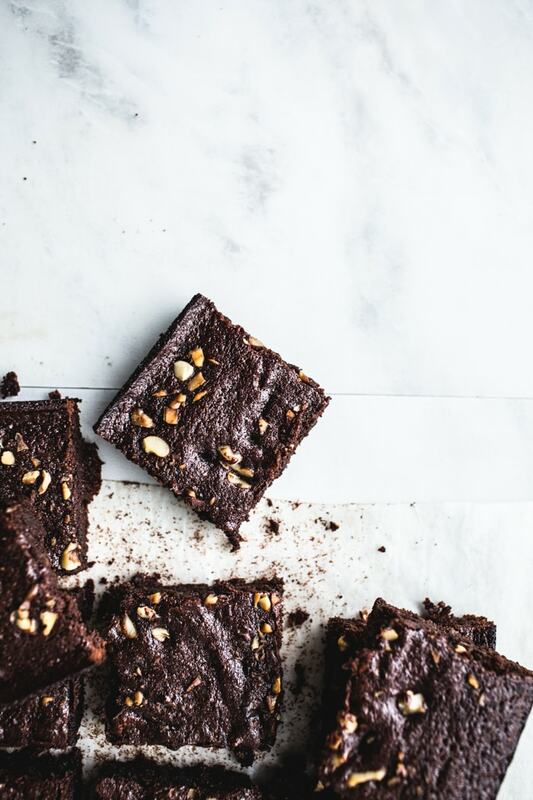 When I was looking through my friend Josh’s new book The Slim Palate Cookbook (full disclosure, that’s an affiliate link), I noticed he’d used coconut flour in a brownie recipe. I had a bag of coconut flour in the cupboard (and, at £6 a bag, I was like ‘yeah okay lets do this, use up some coconut flour! !’) so decided to give the recipe a go as it looked normal for egg quantities and the picture was making me pretty hungry. Verdict: Now I know what I’m going to be using the rest of my coconut flour for. If you don’t have coconut flour/can’t get it/ don’t want to spend dolla on a bag for one recipe (I wouldn’t blame you) then you can sub in almond flour (see the recipe notes) which also has a healthy fats, protein and fiber. Win win. We all get filling brownies. Hooray! (If you want to check out more about Josh’s blog, Slim Palate, go here! – I’ve heard that different brands of coconut flours can bake up slightly differently; I used the Tiana brand of coconut flour and it worked really well! Preheat the oven to 350 F (180 C). Grease an 8-inch square cake pan with butter. Line the greased pan with a piece of baking paper. Place the butter into a medium pot and melt over a medium heat. Continue to heat the butter until it foams up and smells nutty then remove from the heat. Add the chocolate to the pot and stir until all the chocolate has melted and mixed in. Add the rest of the ingredients (except the walnuts) to the pot and stir together until well combined. Pour the mixture into the lined pan, sprinkle on the chopped walnuts (if using) and bake for 15-20 minutes - it will look set and dry on top but the middle should still be soft. Leave to cool before slicing into 16 squares. These look amazing, never worked with coconut flour before, does it have a coconutty kind of flavor? Thanks Cheri! It does have a coconutty flavour but the chocolate masks it so the brownies don’t actually taste of coconut at all! I have a bag of coconut flour sitting in my pantry as well! I’m scared of it, lol! These look SO yummy. I love it when dessert has some healthy benefits! It can be pretty daunting to work with but it TOTALLY worked in this recipe 🙂 thanks Leigha! Okay, so obviously your photos are always gorgeous, but these are especially breathtaking. I absolutely love them (and the brownies)!!! I thought I was the only one that ate a bunch of food when I was stressed out! When finals come up, I have difficulty staying away from the kitchen. Who am I kidding? I have trouble staying away from the kitchen always! These brownies are going to make it even harder. Thanks a lot Izy! I have been looking for an awesome GF brownie recipe! Last time I made mine with beans and it was more fudge like than brownie like! They’re define to worth a go 🙂 hah, I’ve never dared to try those black bean brownie recipes! Wow these look fantastic! So dark and rich! Your photography is amazing as always. Could you also substitude the coconut flour with oat flour? I’ve just recently switched to coconut flour from wheat flour, and I know what you mean about needing more liquid. Besides eggs, you could also use almond milk or maybe even coconut milk? 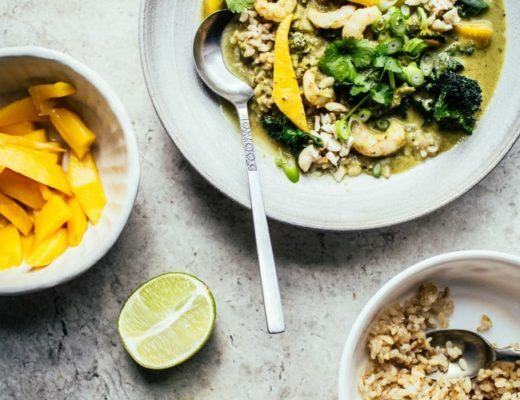 A fantastic website that promotes gluten-free, low-carb, high-fat foods is Maria Mind Body and Health, you should check it out for more coconut flour recipes. It is expensive (I have Tiana too), but it goes a lot further than wheat flour or almond flour (aka ground almonds). where do you get your unsweetened baking chocolate? Thanks for the tip about using the milks! and for the tip about the blog, I’ll have a look. I bring it back from America, but if I don’t have any then the Lindt 90% stuff is the easiest to find. Chewy brownies like this are the best. LOVE! Can’t wait to try your version! I love the flavors you used. Do you think I could grind up coconut flakes and use them in place of the coconut flour? Thanks Lisa. Tell me about it, brownies are definitely a weakness of mine! Let me know if/what you try! ahahah, well I don’t know if I can get away with calling them healthy..but they’re certainly better for you than regular brownies! I just went and stalked your recipe archives to find that brownie recipe 😉 I may have to try it out! Gorgeous! And so smart. Adding these to my brownie archive! Stopped by because I saw this gorgeous photo on Pinterest, but I must say, I do the exact same thing during exams (unfortunately, my first is tomorrow…ah!). This time I’ve been eating a chocolate biscotti recipe I’ve been working on. I think I would devour all of these brownies right now if they were on my counter! PS. Congrats again on your nomination and you have my vote!! hahaa I KNEW I couldn’t be the only one in this situation. This recipe looks amazing. I have a question regarding the honey – do you happen to know of a low carb substitute? These are almost perfect to make for my husband, who is low carb (would use almond flour), but I don’t know of any artificial sweeteners that would work the same. In the book, Josh suggests using 1/2 cup of unsweetened almond milk plus 1/2 tsp of liquid stevia. I haven’t tried this out personally, but sounds like it’d be fine. Just wanted to ask – I’ve got a bag of desiccated coconut. Would blending that into a finer flour work in the same way or does it have to be ‘juiced out’ of all it’s milky goodness before it works as a flour? I had someone ask a similar question so I’m pretty much copy + pasting my response from above, here haha. 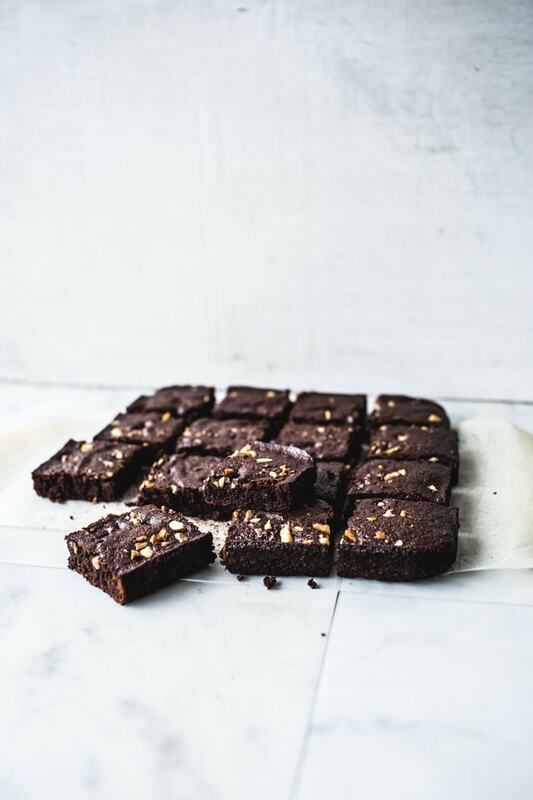 thanks for introducing josh’s blog and also this new brownie recipe. i have never worked with coconut flour but almond flour, yes i have it and im gonna make this soon. Coconut flour is super weird. It’s kind of exciting but stressful to come up with recipes to use it in! Great, hope you enjoy them! Um, I am the WORST stress eater! Candy is my ultimate weakness when things are rough. Sour candy, specifically. Don’t ask. Definitely have to try these brownies!! Whenever I’m in the US I buy those sour patch watermelon candies. I usually can’t stand watermelon anything but THOSE CANDIES are just too good. I can imagine stress eating them to the max if I could get them here. Hi Cherie, You should be able to use 1/2 cup (65 g) of all purpose gluten-free flour in place of the coconut flour. Hi Izy! I just made these and THEY. ARE. FABULOUS. I am so stinkin’ happy right now. I also used extra dark cocoa powder, halved the honey with maple syrup, and sprinkled white chocolate, semi-sweet chocolate chips, and walnuts.. 🙂 🙂 BEAUTIFUL!! We at OliveandPearls.com have been trying to incorporate coconut flour into our baking too! Its usually done in combination with a few other gluten-free varieties. Love the idea of using them in brownies… I bet it would even be great featured centrally with the whole shebang: coconu oil, sugar, flour, and flakes !! Love a good gluten free recipe! YUM! 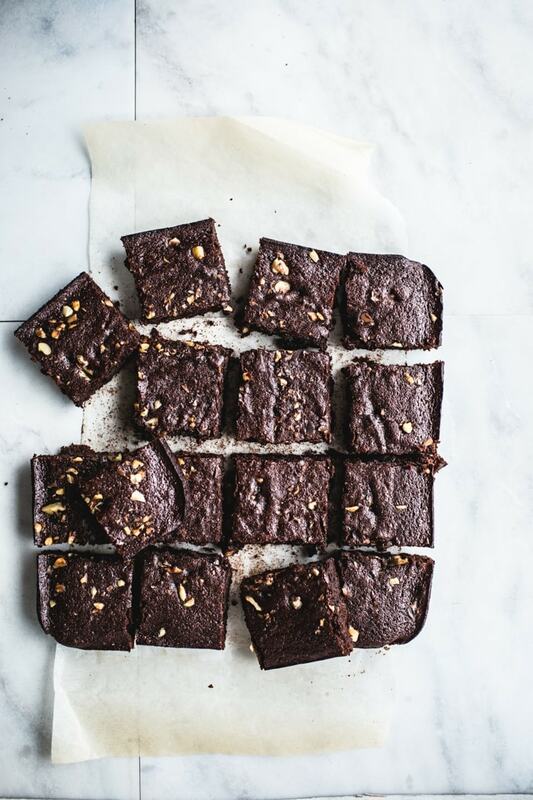 These brownies look incredible, I need to try them out soon! I stress bake, which then leads to stress eating! Love the photos of these brownies! I think I need to make these…stat. 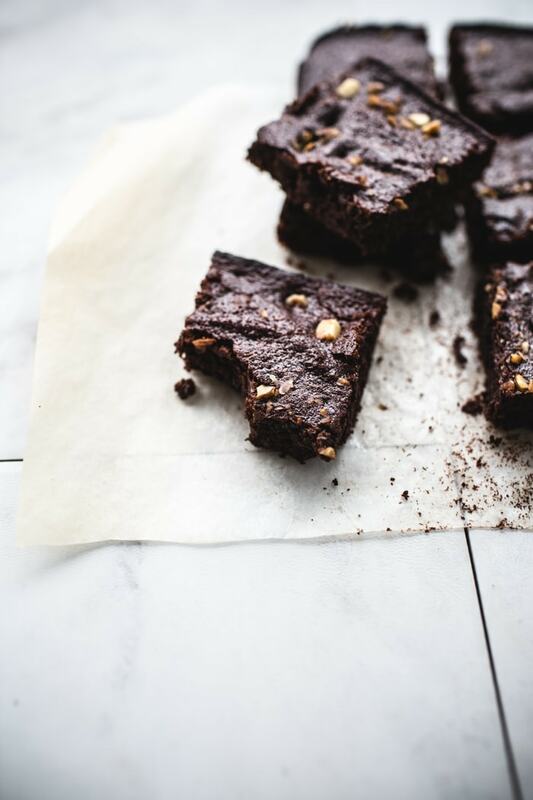 I really love this idea of making the brownies a little healthier (and tastier) by adding coconut flour. These look so dense and fudgy and I love your photos, too! Haha, I am also a stress eater. I’d stress eat the whole batch of these brownies if I made them! Thanks for posting this brownie recipe! My dinner guests all agreed that they were the best brownies ever, never mind that they were gluten-free. Substitution note: I didn’t have quite enough honey on hand, so I filled up the rest of the measuring cup with maple syrup, , maybe an ounce or so. It worked fine. I loved the texture and richness of this treat! Yummm! i was just wondering about the method; when you add all the ingredients to the butter and chocolate in the pot, is the element still on? Ohhh my goodness oh my goodness oh my goodness. I can’t wait to try these out. I have a bit of leftover coconut flour from when I was experimenting with coconut flour pancakes. Thanks so much, I am taking a break from flour (genuine sad face) and have been needing some info on coconut flour substitution – thanks. I’ll make these for the kid’s lunch box treats for next week. Hi, I just saw these, and I’ve got to admit; they look delicious! My mum can’t eat gluten and her birthday is coming up on Tuesday, I was wondering the coconut flour is it, can I use gluten free flour instead? My mum gets it from the pharmacy, and I’ve always wanted to use it. How much would I need, flour wise? By the way, could I make a non gluten free recipe by adding normal flour instead of the coconut flour? I’m pretty sure you can replace the coconut flour with 1/2 cup (125 g) of regular flour or gluten-free flour, and they’ll be fine! Finally a gluten free brownie I can feel comfortable feeding to the grandkids! can you substitute granulated sugar for the honey? thanks so much!!! To improve the texture of the brownies freeze them, they don’t really freeze but develop a chewy texture more like a real brownie. Eat them right out of the freezer. If I’m low carb, what would you recommend for replacing the honey ?? It seems the liquid/syrup is needed for the recipe. Thanks !! looks yummy. thank you! i am wondering if you can mix a bit of coconut flour and a bit of almond flour and if so what proportion would you recommend? Brownies looks yummy and tasty. Kids will love this recipe. 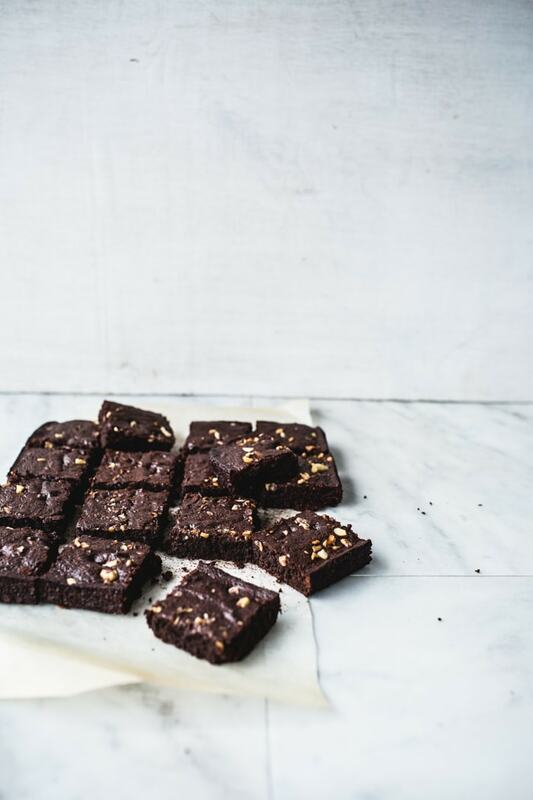 Always hesitant to try coconut flour brownies as they take up so much liquid but these just look mouth watering!